How do I change my Recommendation Box Placement? You can change the Recommendation Box placement in the Personalizer admin panel's Box Designer. 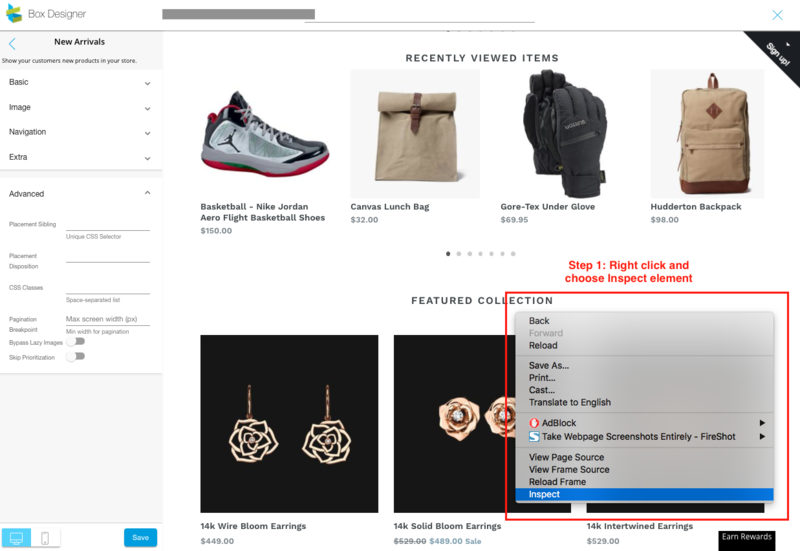 Step 1: Navigate in the site preview to the page you would like to change the placement of the boxes. Step 2: Click on the Page Setting (the changes will apply to all the recommendation boxes that is in that page) or the specific recommendation box that you would like to change the placement of. Step 3: Click on Advanced. You will see 3 fields: Placement Sibling, Placement Disposition and CSS Classes. The placement sibling is the section of your web page that the recommendation box will be placed above of. Websites are divided into sections such as div.class, section.class and id. Follow these steps to find the placement sibling you desire. The placement disposition is the relative position of the recommendation box in relation to the placement sibling you identified. Sometimes, store content is not the full width of the screen(i.e. there is empty space on either side of your page content. If that is the case, the recommendation boxes may run the full width of the webpage and you may need to add a class to ensure the recommendation boxes are the correct width. Add a class to our recommendation boxes to apply any page widths. The most common classes used are container, page-width and row. Tip: Go to this article to know more about HTML classes.